Still working on Bull #2. For all the animals I have been using my support bar. It is clamped to my vertical pieces and can be moved up and down as needed. This is particularly helpful when working wet-on-wet. I've added some lighter rump sections. Next up, the antlers. Rather than starting with his antlers, I wanted to paint his body first and make the value adjustment relative to Bull #1. 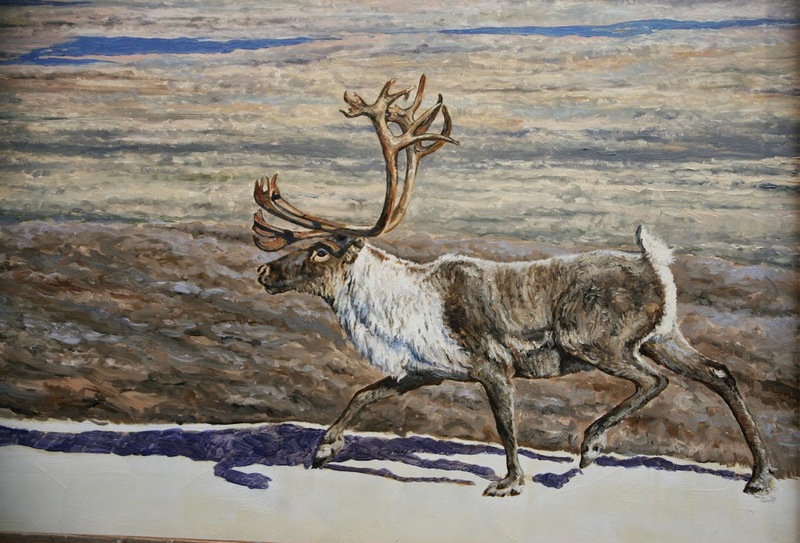 Here in addition to his antlers, his bell and back still need to be painted. Note: For both bulls I have put in a turpentine wash for their shadows. Bull #1 has a duller and more purple shadow while Bull #2 has a more intense blue shadow. Much of it will be covered by tundra but some will peak through. I began with the bull's antlers and worked my way down. Below you can see the lighter areas have been painted. I also lightened the bull overall and made some modifications to his antlers. 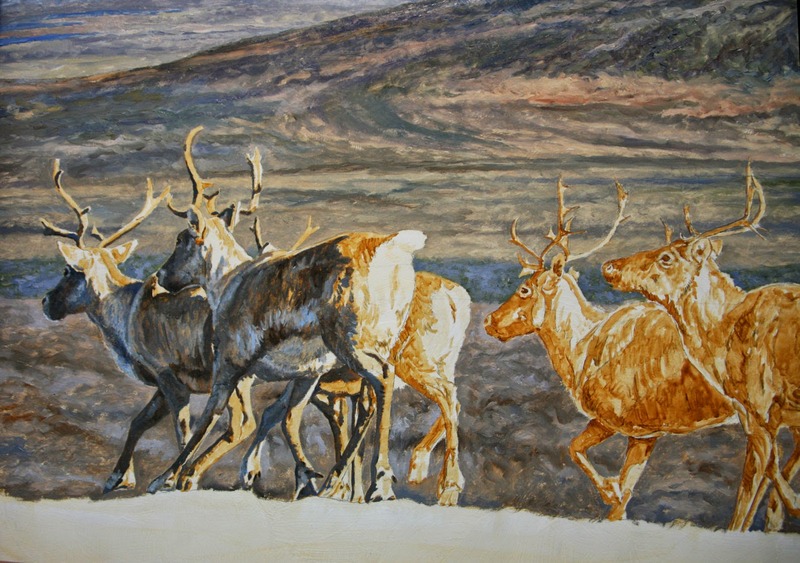 One of the reasons I painted all the shadows first is to keep the color intensity the same for these running caribou. If they were too dark or the hue was too intense the attention would be drawn away from the bulls. In adding the light sunlit sections, I kept the transitions soft. 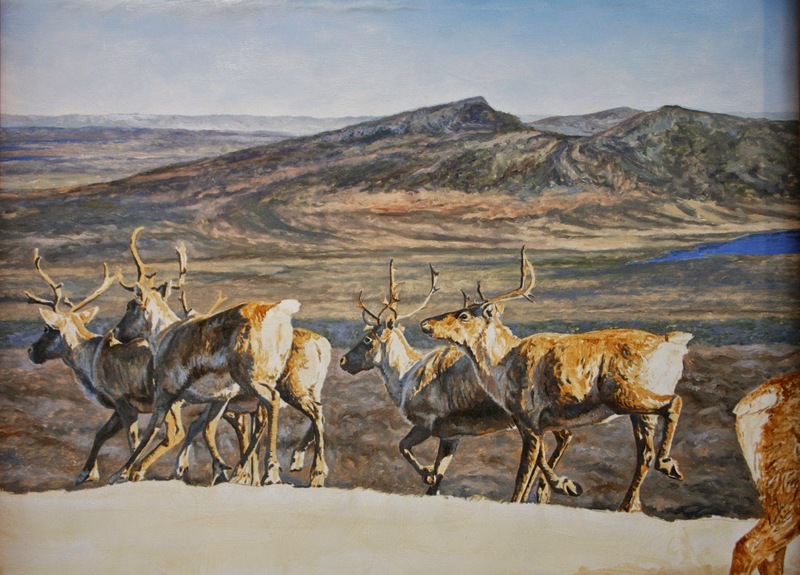 This will help keep these caribou further in the distance than the bulls. 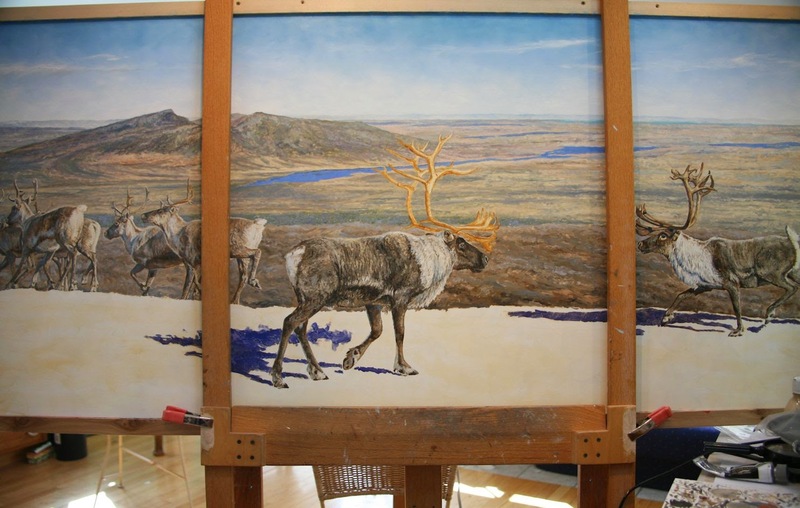 Though landscape can add so much to a painting, my favorite part is always the animals. They bring the piece to life. 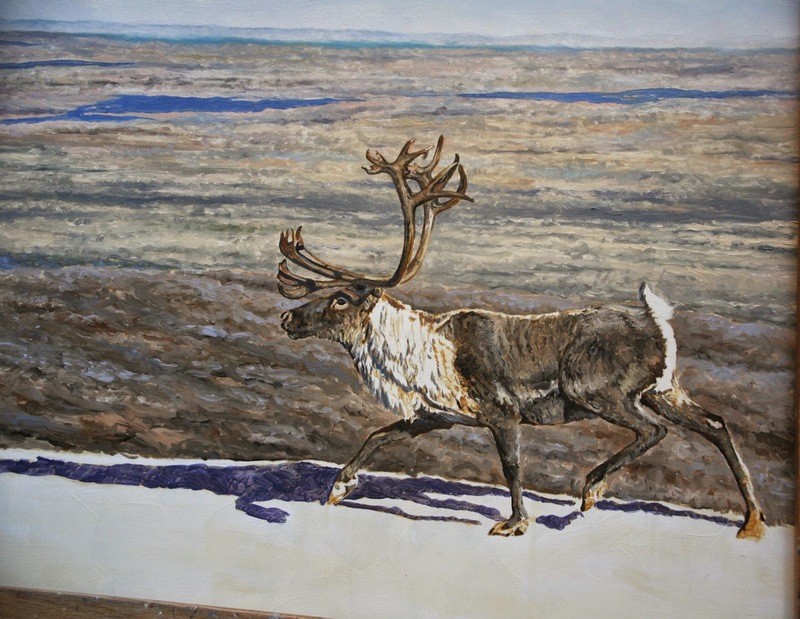 I'm starting with the running caribou. Below the shadows have been painted. 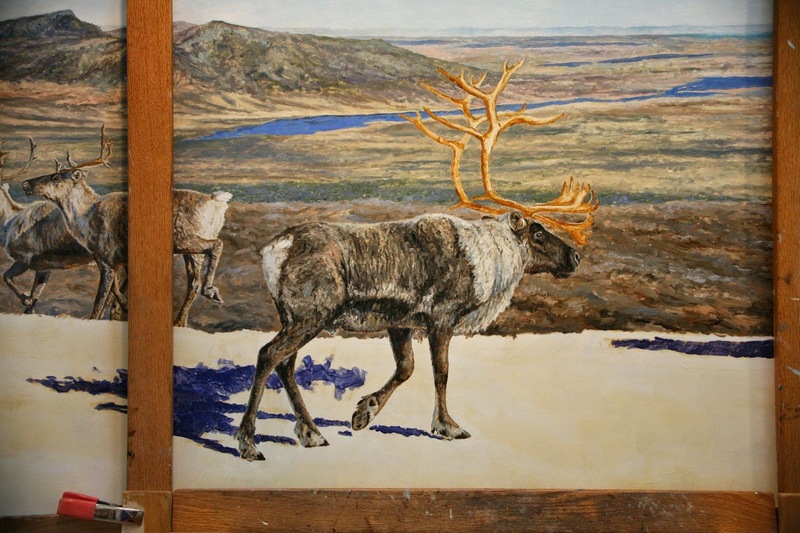 Might be a little hard to see on these images, but the shadows have cerulean blue and ultramarine blue. 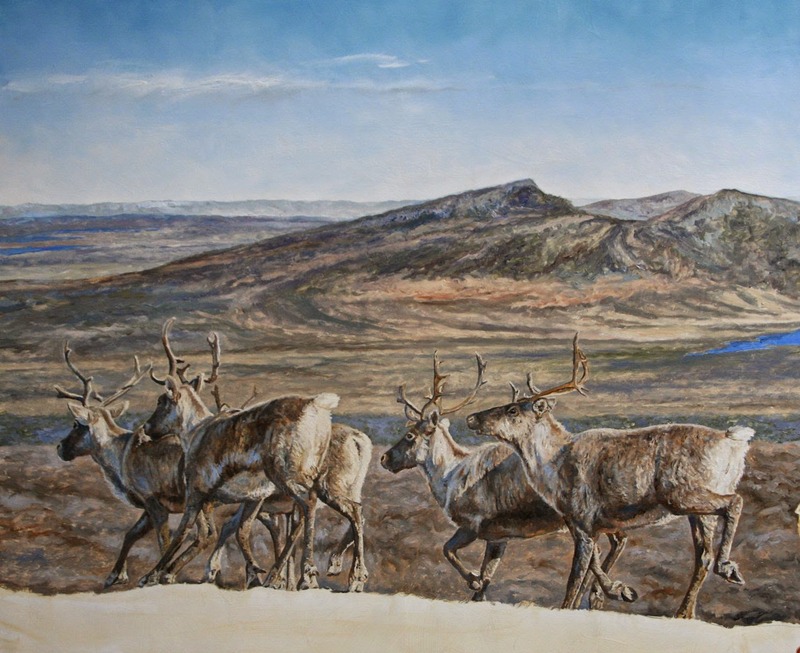 I started painting the landscape directly behind the caribou with colors too bright and too warm. All of a sudden, all I could see was burnt sienna leaping from the painting. I mixed up some light blues and purples and with some blending, settled the background back into the distance. I might play with it a bit more but there needs to be some warmth in this middle ground to form the transition with the foreground. 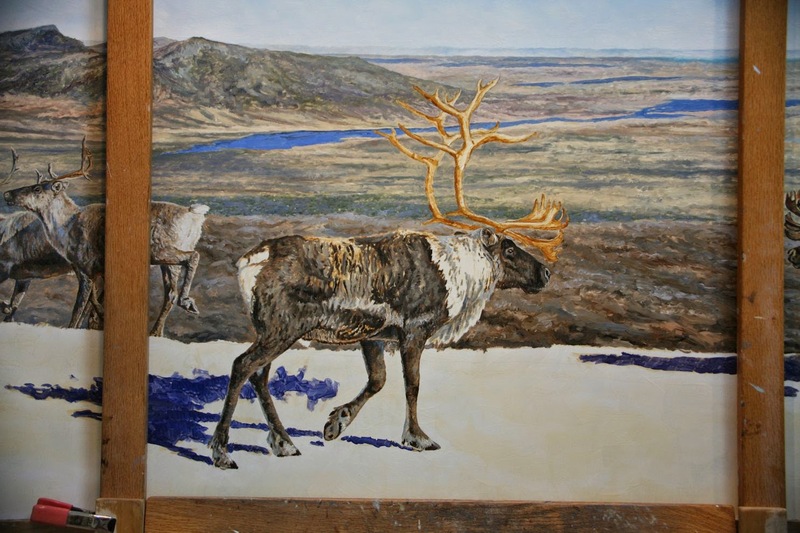 Once the foreground is in and the caribou are painted, I'll have a better judge on the balance.